With more than a hundred-thousand miles of trails in the United States, the National Parks house some of the best hiking around. Your boots can take you places and help you experience the natural and historical legacy of the land that you just can’t experience riding in a car. Try some of our favorite trails from coast to coast that span all levels of expertise. Start your day by taking a boat across the impossibly blue lake to the pyramidal Wizard Island where your hike to the summit will begin. This 2-mile looped hike offers unparalleled views over the massive volcanic caldera of Crater Lake. The boat will drop you off and pick you up, as there are no overnight stays on the island. While the hike itself is fairly easy-going, the trek up and down to the boat is one of the steepest trails in the park, so be prepared to get your heart rate up. Erosion from millions of years has carved out the natural wonder that merits the name Grand Canyon. At a mile deep, panoramas of the exposed rock offer beautiful colors of gold, oranges, and blues. Hiking the 15.6-mile Bright Angel Trail is a strenuous endeavor that will take even experienced hikers a few days to complete – although covered rest houses, plenty of drinking water, and consistent maintenance make it one of the safest trails. With a starting point near several hotels and dramatic views of the inner canyon, it’s no surprise why it’s considered the park’s premier hiking trail. This easy-to-follow 4-mile trail takes hikers on a slow and steady ascent up Cadillac Mountain laced with pink granite. Hike up to a spellbinding vista of the confluence of rock and sea, and experience beautiful wildflowers and striated granite boulders on the back trail located near Bar Harbor. Because the trail consists primarily of bare rock, prepare yourself for spectacular views in every direction. Pass more than 15 sandstone arches as you explore the aptly named Arches National Park on this 7.2-mile trek of varying difficulty. You won’t want to miss the offshoot trail to admire Landscape Arch, the world’s longest natural arch at a span of 290.1 feet. As the azure sky contrasts with the crimsons and golds of graceful arches, spires, and fins, find yourself feeling closer to nature. Be prepared to get an early start as parking is limited during the popular summer months and temperatures can be extreme. Escape some of the crowds of Yosemite along the Mist Trail, an arduous trek to the tops of the powerful Vernal and Nevada Falls – the total distance depending upon how far you’re willing to hike in one day. 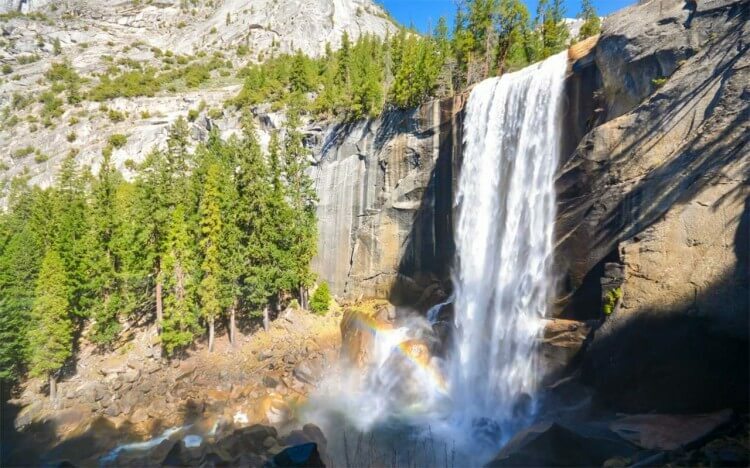 As you climb up nature’s "giant staircase," you will find yourself rewarded with stunning views of the turbulent and beautiful waterfalls as they cascade over the towering rocky ledges. Bring a raincoat if you don’t feel like getting wet, as the trail is named for the spray that has been known to soak hikers. Hawksbill Loop is an easy beginner’s hike that will take you to the highest peak of Shenandoah National Park at 4,051 feet. Prepare to break a sweat on the steep initial incline as you begin – you will travel up about 600 feet in elevation over a short 0.7 miles. As you reach the summit, get ready to enjoy sweeping views of the Blue Ridge Mountains as majestic falcons soar high above you. Take the long way back as you hike down Skyline Drive, which is sprinkled with lookout points for awesome photo-ops. Hiking and mountaineering diehards can appreciate this difficult 9-mile trail as a prime route to summit Grand Teton and its sister Cathedral Group peaks. As one of the park’s most popular hikes, enjoy five-star views of waterfalls, Jenny Lake, and the surrounding Teton Mountains. As the hike continues, the climb gets easier. At this point, you’ll see a creek flowing and creating shallow pools as well as dense emerald forests and abundant wildlife. As the forest starts to thin, end the hike at Lake Solitude in a glacial bowl surrounded by white boulders and colorful wildflowers. Truly experience the majestic peaks of the park on this unbelievable hike. It’s true what they say – things really are bigger in Texas. If you only have one day to hike Big Bend, we recommend the Lost Mine Trail for its gorgeous views. On this trail admire canyons that cut into the limestone rock and the leather-tough desert where only the hardiest wildlife thrives and the most robust vegetation blooms. While this hike is less than 5-miles long, it’s the perfect introduction to the beauty of the Chisos Mountains and has plenty of picture-perfect overlooks of the distinctive Casa Grande peak, and Juniper Canyon. Enter true Alaskan wilderness on this popular flat tundra hiking trail in Denali National Park. Follow along the brutally cold Savage River and keep an eye out for wildlife such as Dall sheep, marmots, pikas, and caribou. If the weather permits, hikers will be able to see Mount McKinley’s summit at 20,327 feet, the highest point in the U.S., from the path. Enjoy this leisurely hike as you gaze upon the beautiful mountainous Alaskan backdrop in awe. For postcard-worthy views and the chance to spend a night in the world’s largest dormant volcano, try hiking Halemau'u Trail in Maui. Enjoy dizzying vistas, navigate switchbacks and narrow cliffs, and climb over ancient lava flows on this otherworldly hike. The trail leads you through shrublands and valley rims before descending into the Wilderness Area to reveal the dramatic volcanic history of the island.